In photography, Dynamic Range refers to the difference between the lightest whites and darkest blacks in an image. Cameras have a rather limited dynamic range, especially compared to the human eye. However, the dynamic range of a photographed scene can be increased by capturing multiple exposures and then merging them into single image. 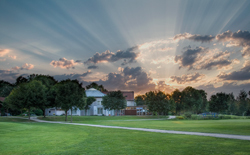 The resulting photo has a higher dynamic range, also known as HDR. HDR photography has gained in popularity over the last several years as software has become available to automate much of the process. A popular way to treat the images is to apply tone mapping, which adapts contrast so HDR images can be viewed on devices with lower dynamic range, such as standard computer monitors. Tone mapping is often used to create images with exaggerated contrast and radiance values for artistic effect – so much so that HDR is now becoming known for this surreal look. At TSI, we started creating HDR panoramic images by hand in 2003. One goal of ours has always been to accurately represent what the human eye sees in real scenes. Since HDR has now become somewhat synonymous with the embellished artistic look, we have decided to rename our basic technique to more correctly describe the life-like exposure balance in the 360° panoramas we produce. We call this technique Integrated Dynamic Range, or IDR. IDR Technology increases the dynamic range of an image by combining different exposures to create more realistic and fully exposed picture. IDR technology allows us to construct 360° images that reproduce scenes exactly as the eye perceives them. Please note: we made this movie when we still used the term HDR for this technique, but our IDR technique is a more accurate description for this process.